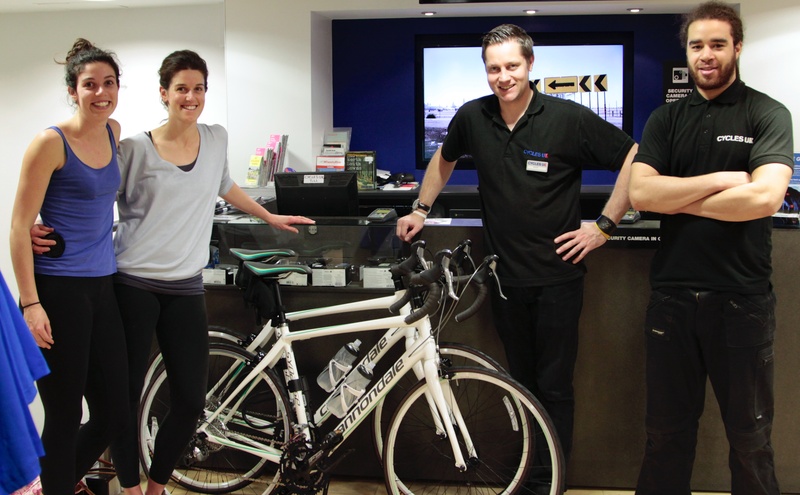 All the guys at Cycles UK Bow Lane deserve a medal – they couldn’t have been more helpful this morning! And we are so grateful for their generosity. As it turned out I needed to be at home in the evening to be with Daddy so we made a last minute decision to get up at 5:30am today to try and collect the bikes first thing… it turned out excellently. Despite the fact that we had made an appointment to get all the bikes and gear fitted at 4:30pm today – they weren’t at all fazed when we turned up at 9am. We were in the shop for nearly THREE HOURS and Dave and Dane were so helpful and patient with us. They made sure the bikes fit us perfectly – we actually cycled them indoors with the rear wheels raised so that they didn’t move, which surely is something every shop should do – so they can really see if you are able to move properly. To cap it all – we actually managed to leave some of our gear behind (we were a bit flustered by the time we left as we were in quite a rush to get back to Daddy, but by the time we’d got home Dave had already emailed us to let us know what we’d left and that he was posting it to our home address – amazing!! Thank you so much Danny, Dave and Dane – We couldn’t be more grateful! I actually managed to do a short test ride this afternoon back in Oxford (my first real session on a road bike!) and couldn’t be happier with the bike and can’t wait to start cycling to work. If you’re thinking of buying a bike we can’t recommend these guys enough!! Now we just need start working on the swimming… Aaaahhh! Ps. I showed Daddy the pictures and I think even in his current condition he got vicarious enjoyment from seeing us get our new toys!